FULTON, NY – Exelon Generation Nine Mile Point Nuclear Station served as a Gold Level sponsor for Oswego County Opportunities recent “Save Our Shelter” Bowl-A-Fun. Representatives of Exelon Nine Mile Point Plant present Oswego County Opportunities with a $5,000 donation for Exelon’s Gold Level Sponsorship of OCO’s recent “Save Our Shelter” Bowl-A-Fun. 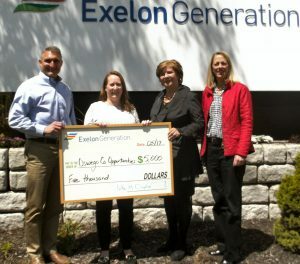 From left are Exelon Plant Manager Rob Kreider, Communications Manager Jill Lyon, OCO Executive Director Diane Cooper-Currier, and OCO Development Coordinator Margaret Barclay. The tournament hosted more than 165 bowlers that hit the lanes in support of OCO’s efforts to save its Runaway and Homeless Youth Shelter. The shelter is a vital resource for youth of Oswego County with no permanent housing. It provides youth with a place to turn to when there is nowhere to go. With the loss of federal funding the “Save Our Shelter” Bowl-A-Fun served as a fundraiser to help OCO continue to operate the shelter until additional funding can be obtained. For the past 26 years, Oswego County Opportunities’ Homeless Services has been a safe haven for abused and maltreated youth in Oswego County. OCO Homeless Services provides 24-hour emergency services and shelter to youth. Through a supportive, nurturing environment that empowers youth to gain the responsibility and decision making skills to attain their goals and have a successful future. One of the most important aspects of this program is its Runaway and Homeless Youth Shelter.